Loraligh Waters pitches for the Lady Patriots in game against the Lady Blazers. There have been few wins for the Tri-Village Lady Patriots so far in this season, but the Lady Patriots seemed poised to upset third place National Trail Lady Blazers. They came into the final inning with a 5-3 lead but they gave up a few hits, allowed the score to get tied and then Trail managed to get in the winning run. The host Lady Patriots did a runner on base in their last at bat but could not bring her around. Tri-Village lost a close one 5-6. The Lady Patriots spotted the Lady Blazers a 3-run lead. In the first inning they allowed two scores – but it could have been worse as the Blazers still had the bases loaded. But after a time out by the coach, the team settled down and got the final out of the inning. They got another run in the second when the batter got on base due to an error and scored on a double. Now it was the Lady Patriots turn to make some noise. Their defense clamped down and held the Lady Blazers scoreless and the offense came alive in the fourth inning. Grace Lipps, Kelsey Wehr, and Bree Wilson all crossed the plate. In the next inning Lipps singled and drove in a run. Lipps would score herself and this put the Patriots up 5-3. The Lady Trail bats woke up again in the top of the seventh and they had some pop in their bats – hitting for extra bases. Both Lauren Sargeant and Jenna Petit had doubles in the inning. Petit would score the go ahead run on a single by Kayleigh Minner. In their last at bat the Lady Patriots got a runner on first, but could not advance them. It was not the upset that they had hoped for, but they made Trail have to work to earn the win. 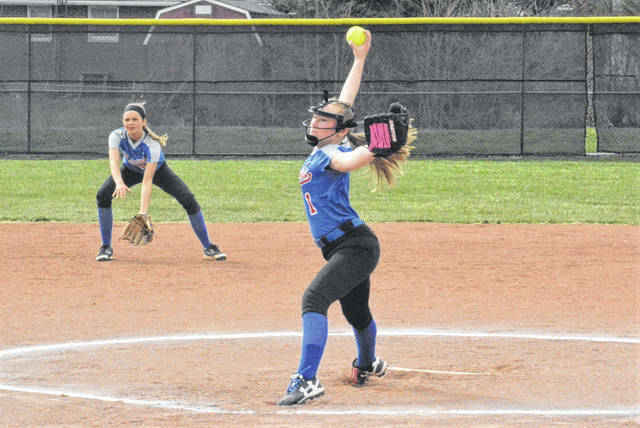 https://www.dailyadvocate.com/wp-content/uploads/sites/34/2019/04/web1_DSC_2102-28532-.jpgLoraligh Waters pitches for the Lady Patriots in game against the Lady Blazers.